Eight-in-ten Americans are dissatisfied with the way things are going in the U.S. – particularly as the fiscal battles in Washington have dragged on – and that grim mood is reflected in the share of voters (74%) who want to see most members of Congress defeated in next year’s midterm elections, according to a new Pew Research Center survey. 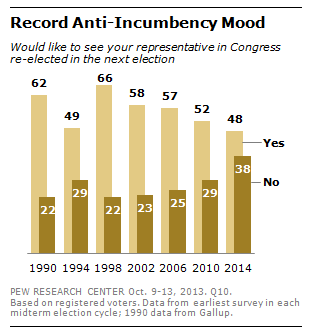 But while that finding points to a general anti-incumbent mood in the country, it is often the case that these same voters regard their own representative differently. That’s why the telling number in the Tuesday’s survey is the 38% of voters who say they want their own representative to be defeated. That’s as high as this figure has been in two decades. In the run-up to the 2010 election year, when Republicans regained control of the House, 29% of those surveyed had said they did not want to see their own lawmaker re-elected. In the September prior to the 2006 midterms, when Democrats won control of the House for the first time in 12 years, 25% had said they wanted their own representative ousted. An early read of voter preferences in next year’s midterms gives Democrats a six-point edge over Republicans (49% to 43%) on the so-called “generic” ballot (which measures partisan sentiment but does not include actual candidate matchups). Independent voters are evenly divided: 43% say that if the elections for Congress were being held today, they would vote for the Republican candidate in their district, 43% say they would vote for the Democratic candidate. The caveat when it comes to all these findings is the number of variables at work between now and Election Day in 2014. While the anti-incumbent mood is high, it is also the case that the number of House seats are in what are considered true “swing” districts” – and not firmly in the hands of either party – has declined sharply over the years.